The luxurious and extravagant Knight Wright business card template is the best option when you want to dominate in your industry. Fashioned from 30 PT black hard suede, this high end business card has a texture like fine leather, producing a refined and sophisticated air. The dramatic and eye catching foil stamping showcases the elegance of the Knight Wright template. 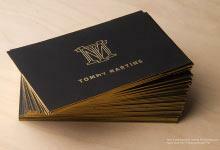 Full bleed matte gold and black foil stamping on both sides of the card add vibrancy to the professional black background, allowing recipients to know your business is at the forefront of its industry. The foil stamping appears like pinstripes on an elegant black suit, making this card ideally suited for businesses in the fashion industry. The excellent quality of this card will let recipients associate your business with luxury and professionalism, and will give confidence that recipients have truly selected the best of the best for their needs.